Report reaching us confirms that Femi Adebayo, son of veteran actor, Adebayo Salami better known as Oga Bello, has completed a new house in Ibadan, which is capital of Oyo State. As we learnt, the handsome law graduate has already moved into the house. On Sunday, December 29, 2013, the producer of the popular Yoruba flick, Jelili, held a quiet house warming ceremony at the said house. We gathered that the house is a twin duplex. 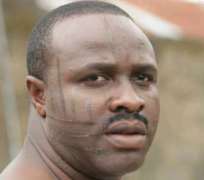 Femi is a top Yoruba actor who is loved by many Yoruba movie followers. He has won several awards. He recently ventured into music with Fuji maestro, Pasuma.